Violet Hart is a photographer who has always returned to cobble out a life for herself in the oddly womblike interiors of Detroit. Nearing forty, she's keenly aware that the time for artistic recognition is running out. When her lover, Bill, a Detroit mortician, needs a photograph of a body, she agrees to takes the picture. It's an artistic success and Violet is energized by the subject matter, persuading Bill to allow her to take pictures of some of his other "clients," eventually settling on photographing young, black men. 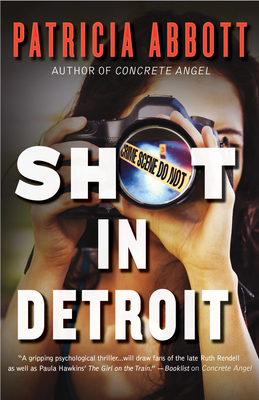 When Violet's new portfolio is launched, she quickly strikes a deal, agreeing to produce a dozen pictures with a short deadline, confident because dead bodies are commonplace in Detroit and she has access to the city's most prominent mortician. These demands soon place Violet in the position of having to strain to meet her quota. As time runs out, how will Violet come up with enough subjects to photograph without losing her soul or her life in the process? A riveting novel of psychological suspense, Patricia Abbott continues to cement herself as one of our very best writers of the darkness that lies within the human heart. Patricia Abbott is the author of more than 100 stories in print, online, and in various anthologies, including Needle Mag, The Thrilling Detective, Plots With Guns, Spinetingler, and ThugLit. In 2009 she won a Derringer Award for her story My Hero. She is the author of two ebooks of stories: Monkey Justice and Home Invasion (through Snubnose Press). Her debut novel, Concrete Angel, was released by Polis Books in summer 2015. She is the coeditor of Discount Noir (Unteed Reads). She makes her home in Detroit. Follow her on Twitter at @pattinaseabbott.